If you have you been looking for a way to dim your LED Lights from a wall mounted dimmer, then this is the LED Power Supply for you. Use any compatible low voltage magnetic dimmer and dim your LED lights from 0-100%. This power supply is ETL listed, CSA listed, and encased in a NEMA 3R enclosure. Built in manual reset thermal circuit breaker allows for shutdown upon an electrical short. 120VAC input voltage only, 60Hz. Output 12VDC up to 200w. Can be dimmed with standard low voltage magnetic dimmer, see list of compatible dimmers below. Transformer is fully encapsulated for protection against the elements. No External Fusing Required. Avoid using dimmers not rated for magnetic low voltage lighting or not labeled as symmetrical forward phase as they may cause overheating of the power supply or cause damage to the load. It is also not recommended to use dimmers with neutral connections or dimmers requiring a minimum load for proper operation. The transformer requires 50% load if not being used with a dimmer. Our rugged and durable UL Listed Ribbon Star Ultra, White flexible waterproof LED Strip Light is fully enclosed in a commercial grade silicon housing for an IP67 rating, making this LED Strip fully water (non-submersible), dust and UV proof. This 118" (3m) ribbon has a male water-resistant connector on one end and a female connector on the other end for easy connection. Comes with 3M™ VHB™ mounting tape on the back, for the best long-term mounting solution. 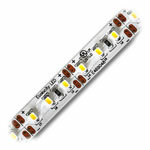 3 SMD LEDs per inch and 54 Watts are required for this 118" strip. This LED Ribbon strip is extremely bright, so bright it can directly replace T-8, T-10 and T-12 Fluorescent bulbs in light boxes, monument signs and can signs. It can also be used for overhead lighting, house eves, under stairs, outdoor lighting and any other application requiring an ultra bright and fully weather-proof LED Strip Light. Comes with 10 clear plastic screw down holders, 4 closed end caps, and 4 end caps with holes for wiring, and waterproof connectors at each end. We recommended that you mount this strip to steel or aluminum, for a good heat sink. This product requires a 12VDC Constant Voltage power source. 6000-6500K color temperature, UL Listed for class2 luminaries and fixtures, RoHS and CE approved. Our high quality UL Listed Ribbon Star Ultra, Warm White flexible waterproof LED Strip Light is enclosed in a heavy duty silicon coating for an IP67 rating, making this LED Strip waterproof (non-submersible), dust and UV proof. Each 118" (3m) ribbon has a male water-resistant connector on one end and a female connector on the other end for easy connection. Comes with 3M™ VHB™ mounting tape on the back, for the best long-term mounting solution. 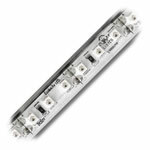 3 SMD LEDs per inch and 54 Watts are required for this 118" strip. This LED Ribbon strip is extremely bright, so bright it can directly replace T-8, T-10 and T-12 Fluorescent bulbs in light boxes, monument signs and can signs. It can also be used for overhead lighting, house eves, under stairs, outdoor lighting and any other application requiring an ultra bright and fully weather-proof LED Strip Light. Comes with 10 clear plastic screw down holders, 4 closed end caps, 4 end caps with holes for wiring, and a waterproof connector at each end. We recommended that you mount this strip to steel or aluminum, for a good heat sink. 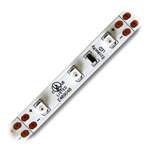 This product requires a 12VDC Constant Voltage power source. 3000-3500K color temperature. UL Listed for class2 luminaries and fixtures, RoHS and CE approved. This is a 2 conductor outdoor and waterproof stranded wire, made for use with any of our single color indoor or outdoor rated LED lighting products. 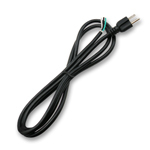 Use this 18AWG stranded wire with our strip lights, modules, wall washers, or any low voltage DC system. Wires are sold in 10ft and 50ft increments and will be shipped in one length when possible. Maximum wire lengths available is 650ft, available upon request, please call for details.